Volcan Tajumulco is the roof of Central America. It is the highest point in Guatemala and the whole region. 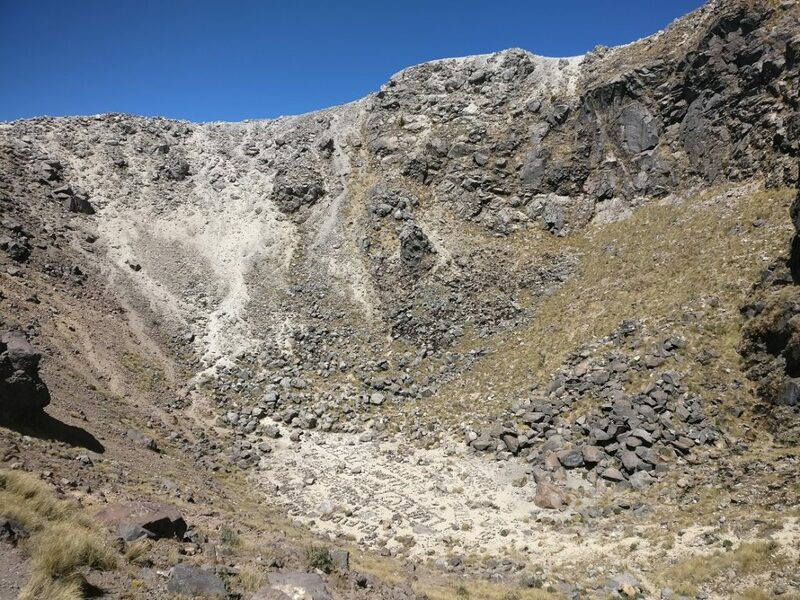 If you are in Guatemala you have to hike volcan Tajumulco! The highest mountain in Central America and Guatemala is Volcan Tajumulco. It is huge stratovolcano, which reaches the elevation of 4220 meters above sea level. Although, it is not the hard mountain to climb without a guide. 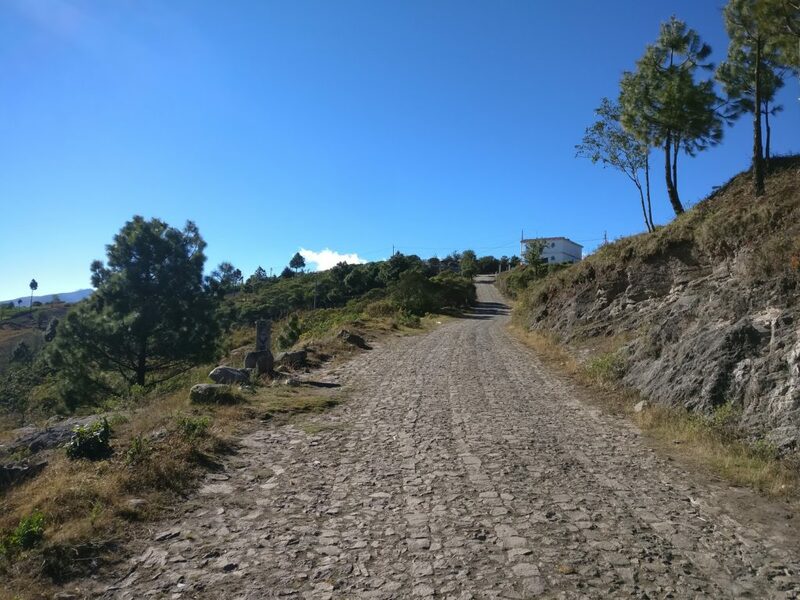 It is definitely possible to climb Tajumulco in one day if you start very early from Xela (Quetzaltenango). If you want to sleep more I recommend to base yourself in San Marcos town before the climb. From the bus station in San Marcos you will need to take a chicken bus which goes to Crucero Tajumulco. The price should be Q10 per person. Bus ride will take around an hour. You will be dropped near the crossroad where you can start climbing the mountain. For most of the time it is going to be a dirt road which is big enough for cars to pass. Probably it will be very dusty and nothing spectacular. I recommend to look for smaller shortcuts which usually are more nice than the main road. It took us 6 hours and 15 minutes from the crossroad to the summit and back to the crossroad. We didn’t hurry and I would say it was an average pace during the hot day. Road from stones while climbing Tajumulco. Started at 8:40 from the crossroad. Starting altitude – 3050 meters above sea level. 12:15 reached the summit, had a picnic, found a geocache. 14:55 we were down at the crossroad. Total almost 14 kilometers of hiking and 1200 meters vertical elevation gain. It is possible that AMS (Acute Mountain Sickness) might hit you before the summit. You migh feel dizzy, you could get a headache. If you start feeling dizzy, you want to vomit then I definitely recommend to go down as soon as possible. 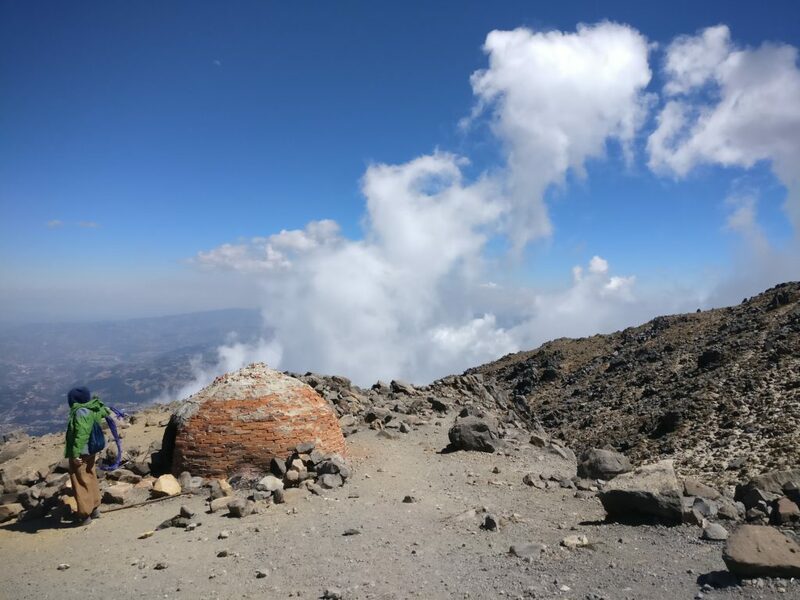 Climb slowly, drink plenty of water and be acclimatized – these are the main advices for avoiding altitude sickness on Volcano Tajumulco. The fee for climbing Tajumulco Volcano is… SURPRISE! There is no official fee for climbing this volcano. You might be stopped by some random guys in a pickup, they could ask for Q20 or something like that. I haven’t experienced it by myself, but I have read other blogs where it happened. Be sure that you don’t have to pay any money to them. Hiking Volcano Tajumulco is totally free and there are no permit or entrance fees. Dusty and Annoying road to Tajumulco. The only expences you will have are chicken buses fares (Q20 return from San Marcos or Q40 return from Xela). Also you might want to have some snacks and drinks while going up the mountain. This volcano in Guatemala is unique. After summiting I definitely recommend to hike the small circular walk around the crater. While walking around it is possible to get down in the crater! Many people have written their names from stones inside there! 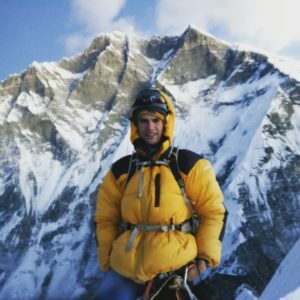 I haven’t done this myself, but I believe that sunrise at Tajumulco should be amazing! Make sure to have a tent, sleeping bag and matress while going for sunrise hike. There are some good places on the way to the summit for pitching a tent and camping. Crucero Tajumulco is located at 15.073847, -91.870121. You can find this point on maps.me named as “Startpoint Tajumulco hike”. Bus from San Marcos will drop you here and this is the trailhead of your hike. Near the summit of Tajumulco Volcano. 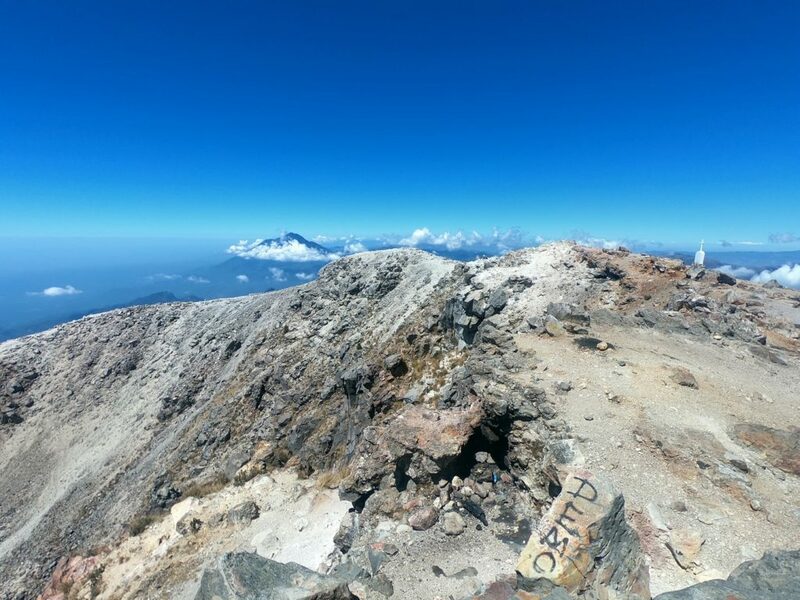 After 3-4 hours of hiking from the crossroad you will reach the summit of Volcano Tajumulco. The highest point in Central America. 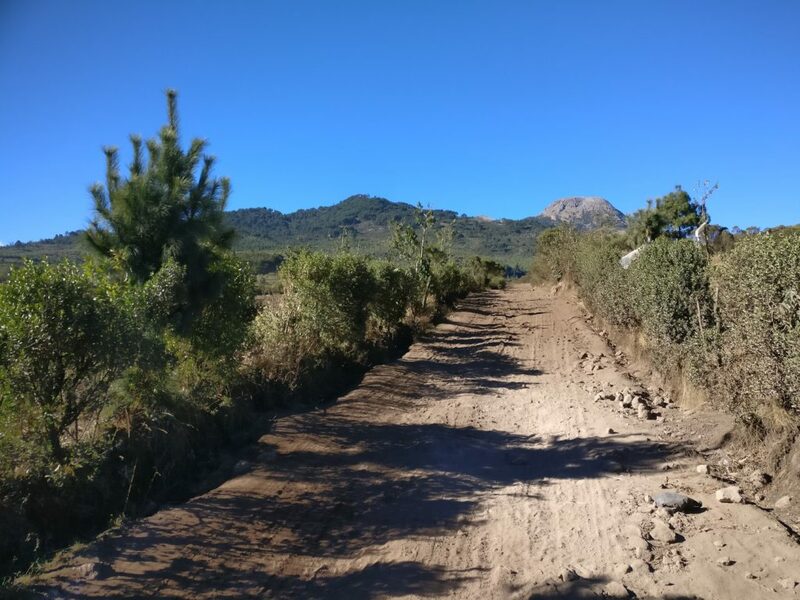 During clear day you will see some mountains in Mexico, other volcanoes in Guatemala and wonderful panorama view to towns and villages around the volcano. Volcano Tajumulco hike is a wonderful activity while in Guatemala. You can do it with a guide or independently and surprisingly there is no entrance fee to climb the mountain. Enjoy the hike!